This is Fly is known to pretty much anyone in their 20’s or 30’s who puts in more than 20 days a year with a fly rod in their hand. One of the guys behind TIF is editor Paris Fleezanis. Here are a few questions and some great replies from Paris. I'm guessing Seychelles with the GT stick. 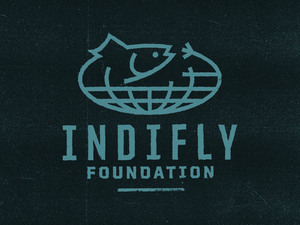 Paris, This is Fly has become the gold standard for fly fishing e-zines. What do you think has made it so widely embraced? Thanks for the compliment I appreciate it. When readers write in and say they love the magazine it charges me to make each issue better and better. I started fly fishing in 2007 and became absolutely fanatical about saltwater fly fishing. I searched for information and media about the sport and culture but I couldn’t find the type of material that I craved. I’ve always related to the skate, surf and snowboard culture and was searching for a similar progressive voice. I think This is Fly filled a void that was missing in the industry. Most importantly I feel it speaks to a wider demographic and even attracts non-anglers and introduces them to the sport. One of your TIF bonefishing stories had a line that went something like “…bonefishing is something that shows up on more “To Do” lists than obituaries.” That prompted me to get out and make my own bonefishing experience happen. Do you have a favorite story about bones from TIF (beyond your own)? I enjoyed Coach Duff’s recent story in issue 22. Duffer is intense and takes his hunting very seriously. I love that type of focus and passion especially since the fish he’s targeting are monsters. It was also great to see that you can catch big bones in populated areas in front of hotels and condos on the beach. The fisherman’s lament is “So much water, so little time.” What are some of the places high on your list for future trips? 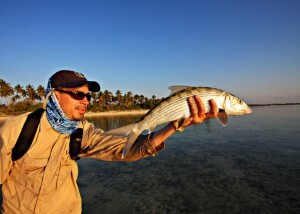 In the last 3 years I have covered the globe pretty well and hit most of the popular bonefish destinations. I have been fortunate enough to visit most of the Bahamas, Mexico, Florida, Kiribati and the Seychelles. I’m heading to Los Roques this month and excited to experience that fishery. It will be bizarre to see bones crashing the surface eating minnows. Future trips that I’m hoping to take are Hawaii, St Brandon’s Mauritius and western Australia. These places hold huge fish. From your recent trip to North Andros, did you have one fly that was a clear winner? The cold front we experienced on our recent trip to Kamalame Cay made the fish very peculiar. We had to down-size our patterns and ended up fishing gotchas and pink puffs. My favorite fly right now is Borski’s fur shrimp. I fish Grand Bahama often and have had awesome results. Others would be McKnight’s Crimp and a Bonefish Deep Minnow. When I think of bonefishing I also think of Kalik and cracked conch. What non-fishing image do you associate with stalking bones on the flats? A slower pace and lifestyle. I live in New York City and the pace is both invigorating and exhausting. The pace keeps you alive and sharp but you do need a break. Everyone is frantically headed somewhere and that focus can wear you down. I cherish each trip that I take when I can escape my rigorous cycle. You have a go-to rod/reel? G Loomis GLX 8wt and Abel 7-8 QC, the ultimate bonefish outfit. Just your typical New Yorker. Thanks Paris. Keep up the good work. This entry was posted on Wednesday, March 10th, 2010 at 3:34 am	and is filed under Fish Tails. You can follow any comments to this entry through the RSS 2.0 feed. You can leave a comment, or trackback from your own site.